But there is an obvious dynamic to this crisis, hidden in plain sight, that you are not being told. They aren’t telling it to you because it doesn’t fit the narrative and the people that lose the most will be young European men, the PC culture’s favorite boogeymen. As you can see, the overwhelming majority of these “refugees” from the Middle East and Africa that get on the boats and cross the Mediterranean is composed of young men, presumably single. And make no mistake, this is the real crisis, but it is a crisis inflicted on the men of Europe. If you have some game knowledge, you know that the dating pool is already skewed. There are far more young single men than young single women. There is already an overpopulation of men. Go into any club or check the stats on any online dating site or app and you’ll know that. About 105 boys are born for every 100 girls. Of course, males are far likelier to die at earlier ages than females, but this has been mitigated drastically in the modern world, resulting in a surplus of young men that have few prospects of finding attractive young women, even when accounting for the fact that males are also far likelier to be incarcerated. Destructive social influences foisted onto women like obesity and fat acceptance, tattoos, piercings, and weird-colored hair make the supply of attractive women that much shorter (although the former is not as large a problem in Continental Europe, at least compared to the U.S.). The problem is compounded even further by the fact that divorce is now common and those divorced older men typically look for younger women. To men of all ages, women are most attractive in their early 20’s. 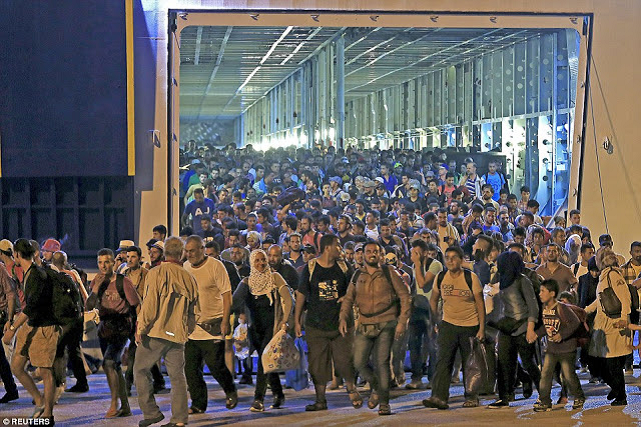 And now, a horde of “refugees” from the third world, overwhelmingly men, is desperate and determined to get onto European shores. The left-wing media like the BBC won’t be telling you any of this, but the result is clear – you young men of Europe are now going to be forced to compete with the ever-increasing third world dregs for your own women. Remember this as more and more boats filled with “refugees” make their way to the shores of Greece and Italy. The third world is coming. It already feels entitled to your homelands, demanding that you give it whatever it wants. And make no mistake, it wants your women. Remember this as you see “refugees” at Calais, the Greek Islands, or Lampedusa. If there were a good amount of hot young women among these “refugees” that were moving to Sweden, France, the UK, Germany, etc., the crisis wouldn’t be as bad. However, there are none to be found. What few women there are among these “refugees” are married and already with children. Because of Europe’s suicidal desire to bring in massive numbers of third-world men, the sexual arms race will spiral further out of control, and native European men will face the brunt of the burden. And even though these “refugees” will undoubtedly be at the bottom of the sexual totem pole, that in itself causes problems. First, it will make girls leery (and they should be, as Sweden’s case shows). Second, it will make white knighting among the local men far worse. But thirdly, and most importantly, large numbers of sexually frustrated young men who do not have access to women cause massive problems in society. It can be daunting. If you’re a young man in Europe, I understand your plight. I understand how pissed off you are about this entirely manufactured crisis (that my own country’s corrupt government embarassingly had a great part in creating). Many of you may even get in legal trouble for speaking out against the European Union’s policy of distributing (and thus inviting more) “refugees.” Unfortunately, you guys in Europe don’t have the First Amendment. And of course, the media is constantly telling you to roll over and surrender your economic and sexual future to these invaders, because doing otherwise would be mean and racist. But remember, the only way to truly win in this world is to accept the injustice done to you and move forward toward your goal anyway. Those are the men that the SEAL teams look for in the U.S. (as described in Lone Survivor), and they’re the men we look for here at The Masculine Epic. They’re the men who can meet a crisis head-on and thrive in it. It can be hard to see this series of events and not lose it in a fit of rage at the incompetence and cowardliness of your leaders, but for you men of Europe weathering the storm of “refugees,” the only way forward is to act in your best interests, both individually and nationally, and not sit at home being mad. With crisis comes opportunity – to better yourselves individually, and rescue your nations from the stagnation and intellectual disease that is political correctness. If you are worthy, you will do it, and you’ll find help here, because in this crisis, unlike your “leaders,” we’re on your side. American and European men are facing similar problems, so we must stand shoulder-to-shoulder against the same enemy. This is the first in a two-part series. In the next post, I discuss my personal experience working with genuine refugees and why most of the people we’re talking about aren’t anything like them. What Do the Off-Year Elections Say About 2018?